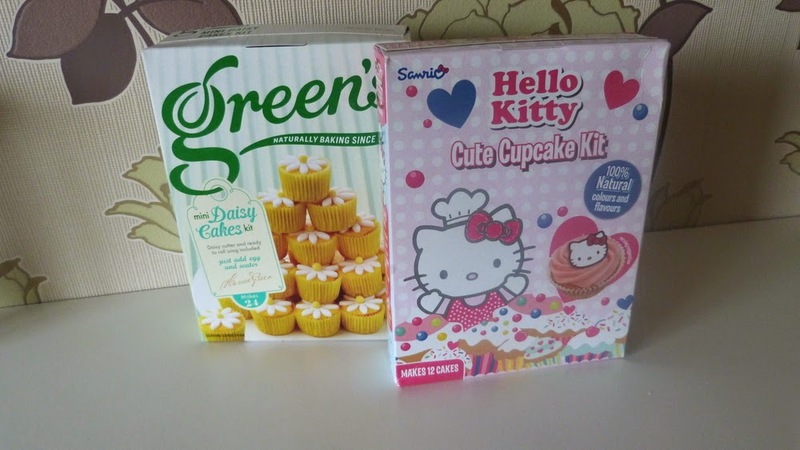 We were sent the new Mini daisy cake kit and to celebrate Hello kitty's 4Oth anniversary this year they also very kindly sent the hello kitty cute cupcake kit too both kits are by greens. which is 1OO% Natural colours and flavours! The box has full details on the back on how to make,bake and decorate your cakes. Your cakes should take roughly 1O minutes to make and 12 minutes to bake, of course it may take you a little longer to make if your making them with little ones. These mixes are great fun, easy to make and a great way to pass some time through the day. The girls love baking and I love munching on their bakes once they are done, It goes without saying our cakes will never end up like the perfect ones pictured on the box if you've been able to get yours some what similar please tell me how!!! No baking is complete without the arguments on who gets to lick the spoon and who gets the bowl of left over cake mix.